Mbale Court judge Suzan Okalanyi speaks during the Bubulo Magistrates Court Open Day event in Mbale yesterday. Photo by Badru Afunadula. MBALE–Mbale Resident Judge Suzan Okalanyi has demanded for more man power, saying she is being overworked. 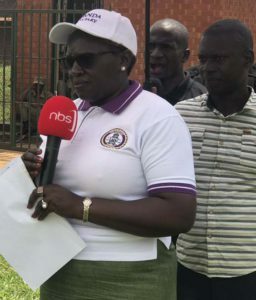 Speaking Thursday at the Bubulo Magistrates Court Open Day, Okalanyi said that given the load of cases that she has to handle, she is forced to sleep at 2am. Even then, it has failed to pay off and that she would need about 10 years to dispense off her current workload. “Mbale High Court Circuit needs at least 10 judges to handle the workload. It would take me more than 10 years on these cases alone,” she said. She appealed to government to increase the number of judicial officers. “Our plea to government is to increase the number of judicial officers. I go to sleep at 2am daily because I have 3,000 cases in my court,” she said. She said that 70 per cent of the cases are defilement cases, adding that this is unacceptable. She further advised the public to embrace court mediations. “Plea Bargain benefits the accused persons and the community. If you plead guilty, your sentence automatically goes down by 50%. Justice is quite expensive. Embrace the new Justice initiatives in courts today to reduce on the cost of litigation,” she said.